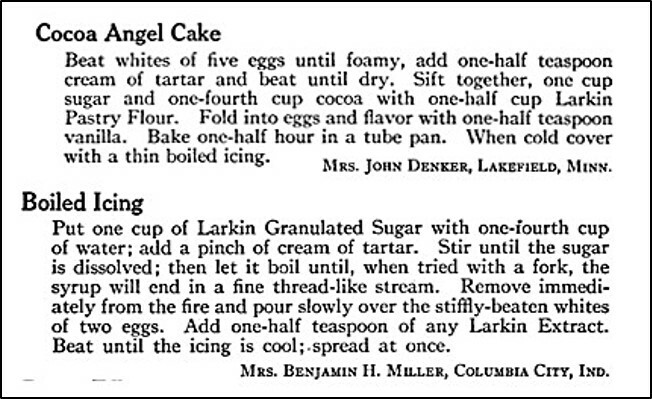 A hundred years ago there were some delightful cake recipes. I recently found an old recipe for Cocoa Angel Food Cake with Boiled Icing. It made a delectable light and airy cake with an absolutely decadent old-fashioned gooey frosting. The Boiled Icing brought back memories of fluffy, glossy frosting on incredible cakes that great aunts brought to family reunions. (Does anyone still make Boiled Icing?) I’d forgotten how good it is. This recipe makes a relatively small cake. It has a wonderful texture, but it is not as thick as many modern angel food cakes. Preheat oven to 375° F. Sift together cocoa and flour, then stir in the sugar. Set aside. Put the egg whites in a mixing bowl and beat until foamy, then add the cream of tartar and continue beating until the mixture holds stiff straight peaks. Gently stir in the vanilla. Sprinkle a small amount of the flour and sugar mixture (about 2 tablespoons) onto the whipped egg mixture; and then fold it in. Continue sprinkling and folding the flour and sugar mixture until it all is folded in. Gently spoon the batter into an ungreased 10 X 4 tube pan with removable bottom (angel food cake pan). Bake for 30 minutes or until the cake is lightly browned and the top springs back when lightly touched. Combine sugar, water, and cream of tartar in a saucepan; put on medium heat. Stir until the sugar is dissolved. Once the mixture reaches a bowl, reduce heat so that there is a slow boil. Continue boiling until the mixture reaches the soft ball stage (240° F.), then remove from heat. In the meantime, in a mixing bowl beat egg whites until stiff peaks form. Slowing pour the hot sugar mixture over the egg whites while beating constantly. Add the vanilla; continue beating until cool. Immediately use to ice cake. Posted on March 19, 2017 March 18, 2017 by SherylPosted in FoodTagged angel food cake, recipe. It sure does. Can you imagine how difficult it would be to make recipes like this using a wood or coal stove? I haven’t had boiled icing in years. I barely can remember what it tastes like, but I do remember how good it was. I’ll have to give this a try the next time I need to take a cake somewhere — although I think we’ll have a little practice session before I make it for someone else! Boiled icing is definitely a little trickier to make than today’s typical butter icing. The boiling process is similar to the process used for making candies – which introduces lots of things that can potentially go wrong. This sounds delicious. I wonder if I could substitute cake flour for the pastry flour and still get good results? I think that cake flour (or all purpose flour) would work just fine. I’m not sure why the old recipe called for pastry flour. The use of so many egg whites (and no yolks) is definitely an issue with this recipe. I probably shouldn’t admit it, but I ended up discarding some yolks when I made this recipe because I couldn’t come up with uses for all of them. I used a couple in scrabbled eggs that I made using a mixture of whole eggs and yolks – but I still had some left over. I loved the boiled icing that Mom made. It was even better the second day – crystallized and crunchy! You are absolutely right. I stored the cake in a Tupperware cake server – but it still got crunchy. I didn’t mind in the least because it was so tasty. A great recipe for the weekend! Oh, yes I do.. only I use it on a regular chocolate cake ,Not a good icing to make if it has to sit for a few days before eating as the icing goes flat. It would be wonderful on regular chocolate cake. The cake didn’t last long enough at my house for the frosting to go flat – though it definitely had a firmer, crunchier texture the second day than the first. Oh dear – that’s too bad. Thank goodness your pan wasn’t ruined. I’ll keep my fingers crossed that 7-minutes frosting goes better. I’m a strong believer in the importance of “feel” when making things like this. Whenever I make candy, I always use the old ice water soft ball/firm ball/ hard ball test in addition to using a candy thermometer – and generally go with the old test if they don’t agree. I’ve never heard of Cocoa Angel Food Cake. It sounds divine. My Mom make the best boiled icing. I’ve never tried to make it, but I might now. I find it amazing that neither this cake recipe nor the icing recipe calls for any fats or shortenings (unless you count the tiny bit of fat in the cocoa). And, the recipes were so tasty that I never even missed it. I used to make boiled icing back when I used to make cakes. I guess I would have to make a cake that used a lot of egg yolks or have a big family breakfast with an egg yolk dish. What did they do with them 100 years ago? I’m thinking that they would have made another recipe that called for yolks – though I didn’t do enough research to figure out what might have been a common “companion” recipe. This recipe sounds really good. I like angel food cake a lot, but I’ve never had a cocoa version it. It sounds like it would be delicious, though. (If that link doesn’t work, I found the same recipe on regular recipe site, too: http://www.cdkitchen.com/recipes/recs/29/Vintage_WW1_Eggless_Milkless_Butterless18384.shtml). Do you think your grandmother ever made a cake like this? I could have sworn that you blogged about something similar once, but when I searched your site nothing came up. hmm. . . maybe my grandmother made cakes without eggs, butter, or milk. I know that I’ve definitely seen recipes similar to the ones you shared in magazines from the WWI era. I don’t think that I’ve ever done a post on this type of cake (at least I don’t remember it) — though I did once do a post on making substitutions when eggs are expensive. Oh, yum. I shouldn’t look at these kind of posts on an empty stomach!